Minister of State, Joseph Harmon and Minister of Natural Resources, Raphael Trotman briefing the media on December, 29, 2017. 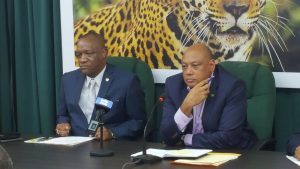 Guyana is still mulling where to refine its portion of oil to be extracted from a Liza well offshore, Minister of Natural Resources Raphael Trotman said. He said a Cabinet sub-committee was yet to decide on whether to take up an offer by Trinidad and Tobago to refine Guyana’s oil at the state-owned refinery, Petrotrin, or if Guyana will send its portion of oil to ExxonMobil to refine. Trotman said Guyana’s portion is estimated to be 14,000 barrels of crude per day. Another option, he said, is for the establishment of a modular refinery in Guyana that would see the creation of jobs. Trotman hinted that there are regional political considerations for refining oil in Trinidad. They include selling oil to the Caribbean on concessionary terms similar to PetroCaribe. One of the challenges, the Natural Minister said, is the fact that Petrotrin is configured to process heavy oil. Guyana’s oil quality is light sweet crude. ExxonMobil intends to begin commercial oil production in early 2020.